SnowWorld, the largest indoor winter sports resort in Europe, enjoys a beautiful illumination. The intelligent lighting control with the iLUMNET system enables flexible changes to control, as well as energy savings. 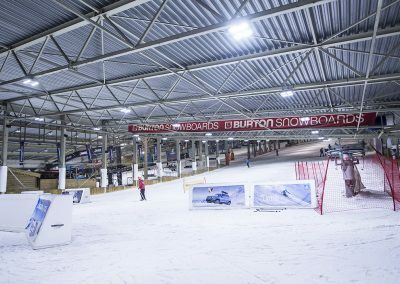 SnowWorld in Landgraaf, the Netherlands, is the largest indoor winter sports resort in Europe with 5 slopes, including the longest slope in the Netherlands and the only indoor FIS racetrack in the world, as well as a large funpark with 20 different obstacles. SnowWorld is open 365 days a year from early morning till late evening. 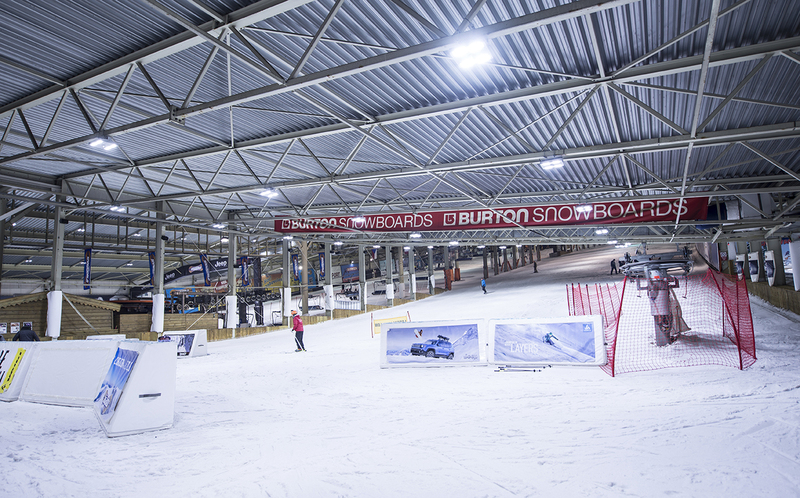 The technical management of SnowWorld carried out a thorough comparison of competing solutions when choosing a new lighting solution for their ski slopes in 2014. They had strict demands for the quality of light, since race conditions pose demands for lighting suitable for video and photography. Also with the long opening hours there is no room for constant maintenance work with the luminaires and changing the bulbs. After 2 years of investigation in 2016 At the evaluation phase of the procurement, the top 5 leading solutions were measured in lab conditions and demo installations were made to compare the resulting lighting conditions. The Valopaa Tornio (VP2503) industrial luminaire was one of the competing alternatives. Although it wasn’t the best alternative on paper or in lab measurements, the demo showed that it produced the most beautiful light on the white snow. The Valopaa luminaire was chosen based on the beautiful uniform light distribution and the pure white light that creates crispy white snow, whereas competing products had tones of green, grey, yellow or pink in their light – which is clearly visible on the white snow. 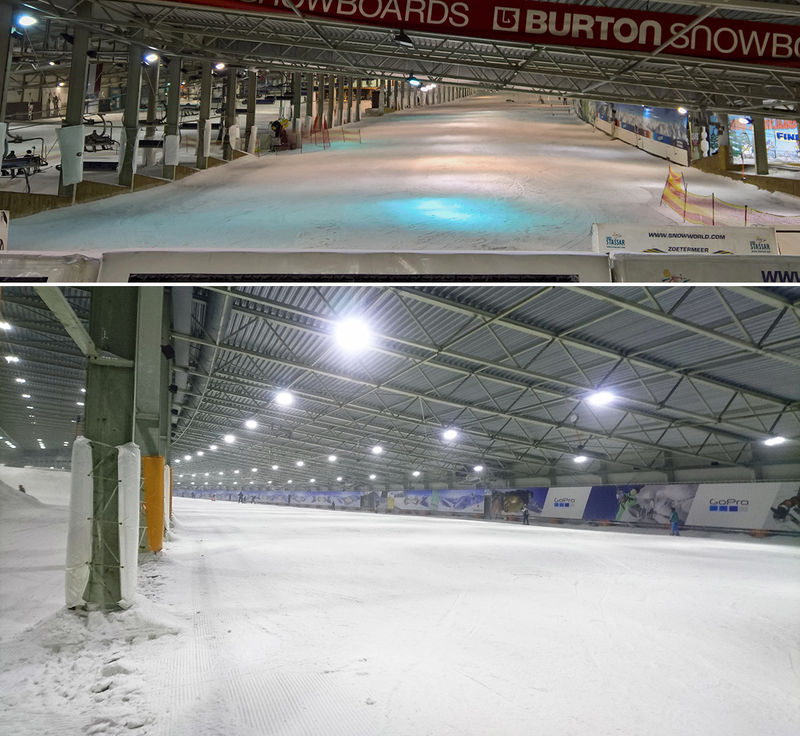 Difference to the old illumination is also remarkable, leading to vastly better experience for customers at the indoor ski slopes. 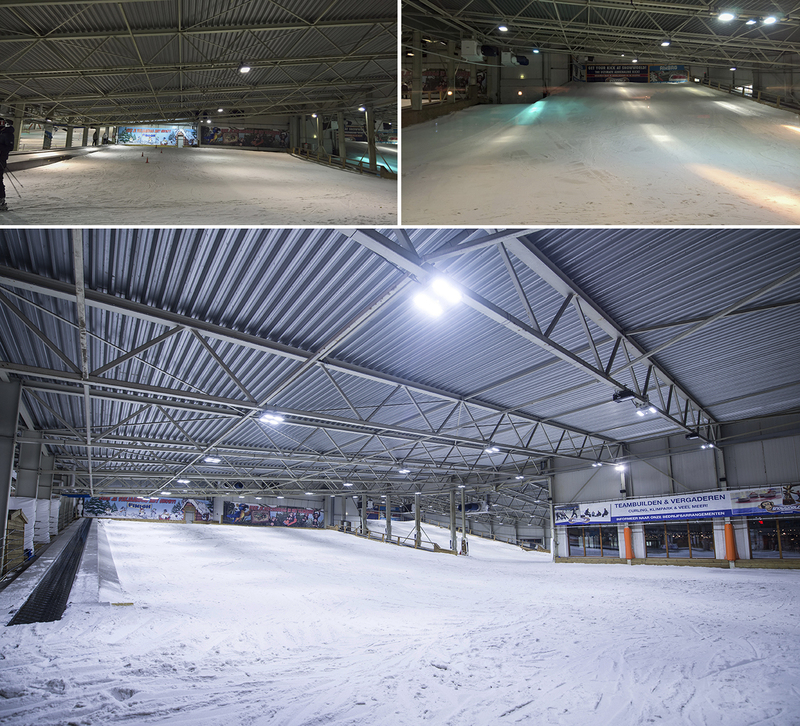 The SnowWorld Landgraaf slopes now have about 420 luminaires in total to ensure even and beautiful illumination. “Take a demo luminaire, and compare the competing products” is the advice from Raymond Danklof from LEDs Go For The Best, a Lumous distributor, who worked in cooperation with SnowWorld and Lumous Lighting in the procurement of the new lighting solution. Wireless intelligent lighting control with the iLUMNET system brought cost benefits in the procurement and installation phase, as no control cabling was needed. It also enables flexible changes to control, energy consumption and fine tuning in the future. At the moment the intelligent lighting control automatically dims the lighting for maintenance hours and even further for night time. The lighting at the slopes is never completely shut down, so the new intelligent control brought a major benefit in different options for dimming and partly shutting off the illumination for the time the resort is closed. At night time every other row of luminaires is shut off, and every other row is dimmed. The rows for shut off and dimming alternate from night to night to ensure even wearing for all the luminaires. It is also easy to make adjustment for special occasions, for example night time events. What’s next? 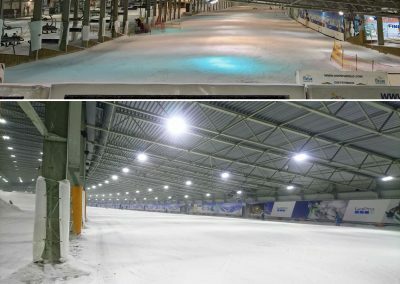 SnowWorld resort in Zoetermeer is the next one in line for lighting update, and a new SnowWorld location in Italy is in the planning. 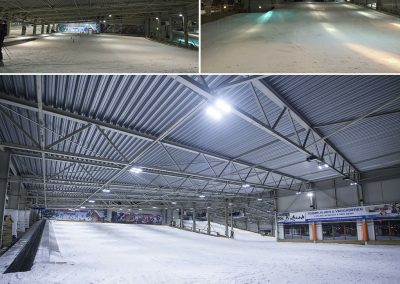 The SnowWorld management has been so impressed with the Lumous Lighting solution that similar solutions are in the planning for other SnowWorld resorts as well. Now that we are in the brink of the summer – how about we hit some slopes in a beautiful light?